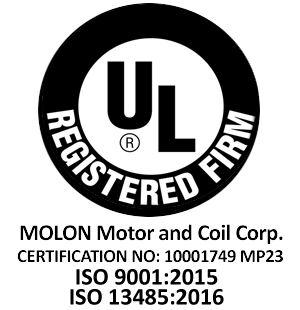 Molon is capable of designing and producing many other types of motors, if there is a need or demand for it. A. Permanent Split Capaciter (PSC): This means that the capacitor is in the motor circuit, permanently, and it is operating between the two windings, the main and the auxiliary, on a phase shift mode, thus splitting the single-phase voltage and operating the motor as a two phase component. If the motor is to be used as a reversible unit, then the main and auxiliary windings must have the same number of turns and wire size (balanced windings). Operating Mode of a PSC Motor: Using winding #1 as the main winding, connect line L2 to (CCW) the resistance in the winding #2 will charge the capacitor C to a level higher than the input voltage, due to the inductive reactance of the LC circuit (C=Capacitance, L=Inductance of windings). This will then drop the voltage across winding #1 and it will start the motor. This is repeated as a function of the 60 Hz line voltage frequency. PSC motors operating at 50Hz will have lower speeds (as a function of 50/60Hz=.8333). Any torque change to the motor’s O/P shaft will cause a quick charge of the C and this voltage will be dropped across the main winding in order to maintain the speed and torque (to a point). If we switch line 2 (L2) to point B we have changed the motor’s rotation and now winding #2 becomes the main and winding #1 becomes the auxiliary. If the motor is used in one direction only, we can reduce the number of turns and wire size of the auxiliary winding, thus increasing the starting and operating torque. We can also increase the torque by increasing the value of the capacitor (HI-C, HI-Torque), but we should be careful because as the capacitance goes up so does the torque, along with the watts and amps of the motor. This increases the temperature in the windings. B. Shaded Pole: This is a low cost “C” frame, shaded pole motor. This type of motor is used only as a two-pole induction motor. The 2 sets of shading rings (the reason for its name) made out of one turn, heavy gauge copper wire generate a very high current to run through it, up to 80-100 amps. That is the reason that these coils get very hot during operation and also attribute to some of the heat rise in the entire motor. This type of motor has very low efficiency. Operating mode of the S-P Motor: When we start an S-P motor, the HI-Current generated in the shading rings sets off a system of forces (Vectors) that cause the rotor to spin. As the rotor reaches the sync speed of the 60Hz, the current through the shading rings drops dramatically, but as soon as torque is applied to the motor’s O/P shaft the current rises trying to maintain the torque (as allowed by design). D.C. Permanent Magnet: This type of motor can be called a D.C. Micro Motor because of its size. With the latest development of wet ceramic magnets, as well as the new materials of rare earth, neodymium and samarium, there is a constant reduction in the size of these motors. All of our D.C. P.M. motors use an isotropic type of ceramic magnet (oriented type) for maximum efficiency and performance. It reduces the leakage flux and puts it back into the useful gap for even greater performance. All D.C. gearmotors are designed at the maximum efficiency point of operation, (regarding the D.C. motor) for maximum performance and brush life. If you know the no-load speed of a D.C. motor and its stall torque, you can develop your own speed torque curve. Also, the no-load current and the stall current determine the current torque line. The D.C. Micro Motor has become very popular because of its size and the power that it can develop operating at 12 or 24 VDC. The D.C. power source is very important for a well performing motor. If the D.C. source does not have the power to drive the motor under operating conditions (from maximum efficiency to maximum power) the motor will not deliver the required torque. The best way to size the current of your D.C. power supply is to use 1/3 of the motor’s stall current as your supply’s rated current. Stall current, 2.45 amps, your supply’s current should be .816 amps or .82 amps. Geartrains: Molon is using many materials for its gears such as nylon, powdered metal, steel cut, fiber etc. 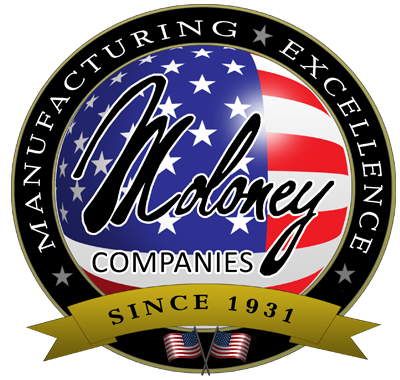 Each application’s gear train is analyzed and developed through computerized programs, especially designed by Molon’s engineering for maximum efficiency and tooth ability to support and sustain the torque.